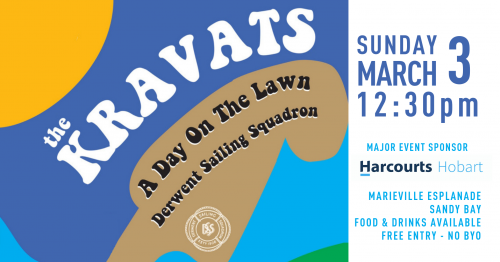 A hugely enjoyable day in summer – the Day on the Lawn has traditionally featured the ever popular mighty Kravats cranking great tunes all afternoon with great music, food, drinks, atmosphere and great company. And it’s free! Thanks to Major Event Sponsor Harcourts Hobart and supporting partners Best Fresh Fruit and Veg Wholesale, Bob And Tom’s. Hampden Rd Service Station, Chandlers Nursery, Da Angelos, The Fibreglass Shop, Innovative Electrical, NJM Marine, Peter Johnston Ship Chandlers, Ronald Young & Co Builders, Saunders and Ward Engineering, T42 – Tavern 42 Degrees South, Two Way Taxi Trucks and Waynes Car Sales.